"The Selling" (2011) starring Gabriel Diani, Janet Varney, Etta Devine and Jonathan Klein is a comedy about a man Richard Scarry (Diani) and his friend Dave Ross (Klein), both real estate agents, who purchase a cheap house so they can fix it up and flip it. It turns out there's a reason it was cheap - it's haunted by the ghosts of victims of the Sleep Stalker serial killer. Shortly after buying the place, the ghosts make themselves known and they don't want anyone else buying the place. The real estate duo hold open houses only to have all the people fleeing in fear after seeing bleeding walls and other scary stuff. Ghost Blog writer/waitress, Ginger Sparks (Devine) soon becomes friends with Richard and tries to help him figure out how to calm the ghosts so he can sell the house. The scares here are mostly for laughs instead of scares. The film is well done and characters are actually well acted for a film that I had previously never heard of. 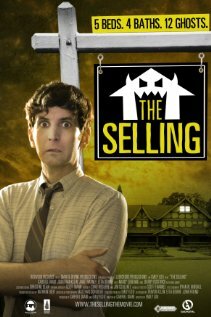 If you want a mix of humor and haunting, give "The Selling" a try.